Schlock-Wire: Full Specs For Scream Factory’s Special Edition Blu-Ray Of DARKMAN – Schlockmania! Crime has a new enemy, and justice has a brand new face. Fans of visionary director Sam Raimi (The Spider-Man trilogy) know well the story of Dr. Peyton Westlake and his tragic transformation into the action hero known as Darkman. Based on Raimi’s short story “The Darkman,” the popular crime-fighting master of disguises comes to life in the 1990 film adaptation DARKMAN, starring three-time Golden Globe® nominee Liam Neeson (Taken) and Oscar® winner Frances McDormand (Fargo). Directed by Sam Raimi, this explosive, action-packed thriller also stars Colin Friels (Dark City), Larry Drake (Dr. Giggles), Dan Hicks (Evil Dead 2) and Nicholas Worth (Swamp Thing) and features soundtrack by award-wining composer Danny Elfman. On February 18, 2014, SCREAM FACTORY™ will release DARKMAN COLLECTOR’S EDITION Blu-ray, featuring all-new interviews with Liam Neeson, Frances McDormand, Larry Drake, Danny Hicks, make-up effects artist Tony Gardner, production designer Randy Ser, art director Philip Dagort and much more! This definitive collector’s edition also contains a collectible cover featuring newly rendered retro-style artwork, a reversible cover wrap with original theatrical key art. 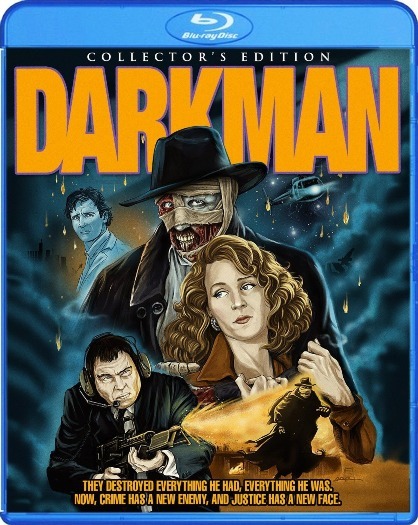 A must-have for loyal fans, movie collectors and pop culture and comic book enthusiasts to complete their entertainment library, DARKMAN COLLECTOR’S EDITION Blu-ray is priced to own at $29.93 SRP. In the darkest hour, there’s a light that shines on every human being, but one…. Liam Neeson and Frances McDormand star in this explosive, action-packed thriller from director Sam Raimi. Dr. Peyton Westlake (Neeson) is on the verge of realizing a major breakthrough in synthetic skin when his laboratory is destroyed by gangsters. Having been burned beyond recognition and forever altered by an experimental medical procedure, Westlake becomes known as Darkman, assuming alternate identities in his quest for revenge and a new life with a former love (McDormand). 1080p High-Definition Widescreen (2.35:1)/ DTS Master Audio 5.1/1990/Color/96 minutes/Subtitles: English/Special Features are Not Rated.